What is a gas insert? Where can I get one? A gas insert is a closed, glass sealed unit that has logs or stones inside, is quite efficient, provides a great deal of heat to the residence, operates with a remote control, and has a blower to get even more heat into the residence. The fireplace is sealed behind it, so no cold air comes in even when the unit is not being used. These units are quite efficient. The remote control can be used to turn the unit on and off, raise or lower the flame, and increase or decrease the air coming from the blower. 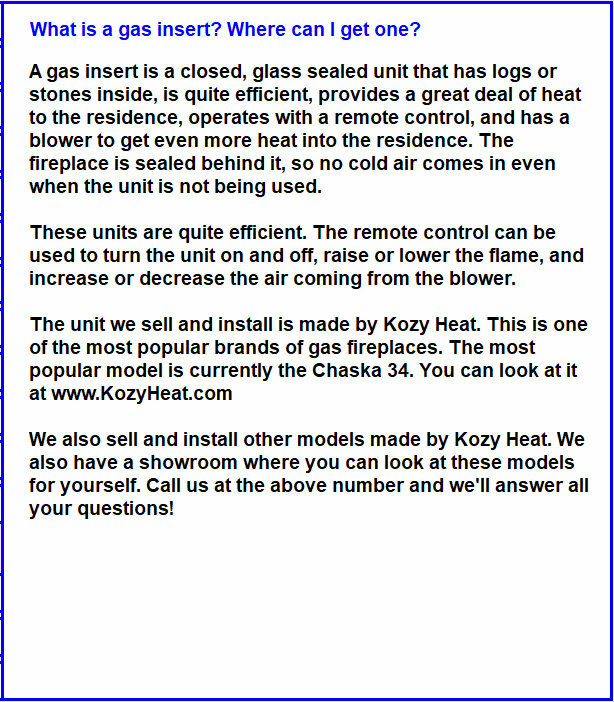 We also sell and install other models made by Kozy Heat. We also have a showroom where you can look at these models for yourself. Call us at the above number and we'll answer all your questions!